I’m hopelessly addicted to Push Notifications on the iPhone. Unfortunately, the system is flawed, in that the more notifications you get, the worse the experience is because it can be hard to manage them all. And one reason I always have the iPhone on me, even when taking around an Android phone, is that there’s no good way to get my notifications on another device. A new startup may offer a solution for both of those problems. Notifo is a Y Combinator-backed company launching today. While it’s currently only available as an iPhone app, the plan is to eventually roll out to all the major mobile platforms, starting with Android and BlackBerry soon. And while the current app may seem pretty barebones, the power resides underneath; it’s a platform. Notifo’s API makes it very, very simple for any site to insert a few lines of code in their site and offer Push Notifications very quickly. There is no approval process, you simply insert the code and you’re good to go; your site is now notification-ready. What’s great about this solution is that it’s creating a way to get all the notifications in one place, rather than having to manage a dozen (or in my case, more) apps all with their own notifications. This way, when you load up the Notifo app, you get a stream of all the notifications you’ve chosen to subscribe to. You could get notifications about new TechCrunch posts, or even when someone responds to a comment you made on TechCrunch, for example. The idea is similar to one of my favorite iPhone apps, Boxcar, but again, this is more about the underlying idea of notification syndication. Boxcar is more about setting up and managing notifications across a range of services they choose — and it’s iPhone-only. Notifo should let you fairly easily set up notifications for just about anything, on any device. While they wait for others to adopt the idea (so far, Listia has), Notifo set up a few services so people can use it with the iPhone right now. 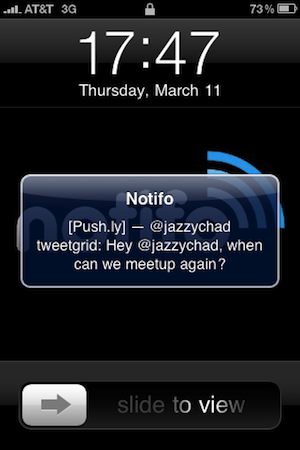 For example, Push.ly allows you to get notifications for all Twitter mentions of your name. And there is a simple March Madness final score notifier that has been giving me updates all day as tournament games end, with their final scores. You can also set alerts for when individual stocks hit certain prices. And the service also allows you to send yourself timed alerts, which are easily set up from the Notifo website. Notifo is the work of Chad Etzel, a developer who was formerly doing some work for Twitter.